The hall we arranged for the birthday party has a really high ceiling. Looks like I have to do balloon decorations on the wall. Can you please give me some ideas for wall decorations with air filled balloons as I am not using the helium. Thanks. The first idea that comes to mind are balloon sculptures on frames, like a balloon heart or star, or the birthday number. We have basic instructions for creating a balloon heart yourself or you could buy a decoration kit including instructions - we feature several of them in our online balloon shop. 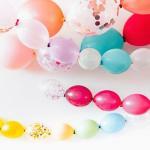 Other ideas would be balloon flowers or balloon garlands. 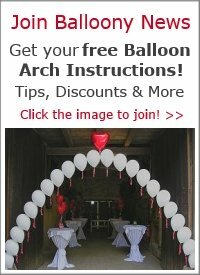 We feature a video about making a spiral balloon arch on our site. 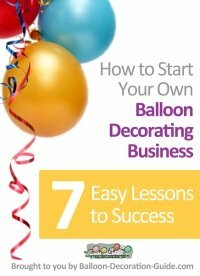 The principle for creating a balloon garland is the same. You just use air-filled instead of helium filled balloons. 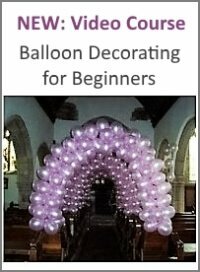 You could also arrange some balloon columns along the wall. Lastly, if you want to go really big, you could build a decoration with the "Rouse Matrix System". This is an expandable, light weight framework to hold balloons together. The Rouse Matrix comes in lots of shapes including hearts, stars, and rounds as well as banner pieces which can either be joined together to create backdrops or can even be cut to your choice of specific shapes. For more information please go to Rouse International. The video shows what pieces of balloon art can be created with the Rouse Matrix System! Good luck for your birthday party.